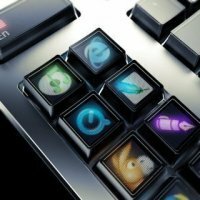 The Optimus keyboard is so cool I had to repost it from Slashdot. This keyboard uses color OLEDs to display images on the keys. This the keyboard can change itself depending on the application you're running, user preference, or language. How about changing when shift or alt are pressed? I really hope this makes it to production and eventually a reasonable price. This is the way keyboards should be.